See the response message's headers and body content. At least one policy in your proxy (also part of the Get started tutorial). 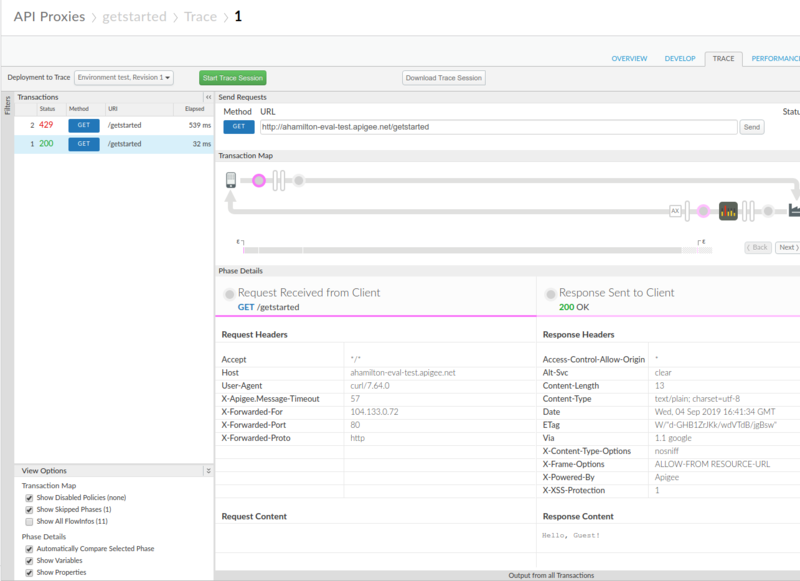 The API proxy Trace tool lets you view headers, variables, objects, and other details such as response time in the API proxy request and response flow. The Trace tool also lets you see how a request or response changes as it is processed by an API proxy. In a previous tutorial, we mentioned that the Content-Type changed from application/xml to application/json after the XML to JSON policy was executed. In this step, we'll use the Trace tool to view this change, view the initial response body (XML) and the modified body (JSON), and see other interesting details. On the Develop tab of the API proxy, edit the Spike Arrest policy's <Rate> to be 1pm again, then Save the proxy. This will allow us to see both successful and failed (over the limit) API calls. In the API proxy editor, click the Trace tab. Call the API proxy again using cURL (or with the URL in a web browser) until you see at least one 200 response and one 500 response in the Transactions pane of Trace. Note: The default HTTP status code for exceeding the rate limit is 500. If you want the status code to be 429 for all Spike Arrest policies used in an organization, a property needs to be set on your organization (features.isHTTPStatusTooManyRequestEnabled). If you're a Cloud customer, contact Apigee Support to set that property. Click the 200 transaction in the left Transactions pane. Its Trace detail is loaded in the main window under Transaction Map, which shows a request/response diagram. The Spike Arrest icon is in the request flow, and the XML to JSON icon is in the response flow. In the flow diagram, click the circle icon in the response, the furthest one to the right (shown in the following diagram). The Phase Details pane shows the data available at that point in the flow. If you scroll through that pane, you'll see the HTTP response headers and body content. Body shows the response content in XML. Body is in JSON format. Now look at an error in Trace. Click the 500 transaction in the Transactions pane. In the main editor window, you see a flow diagram with items in the request only, including a Spike Arrest icon with a red exclamation point indicating an error. Click the small tube error icon to the right of the Spike Arrest icon, and look at the spike arrest violation details in the Phase Details pane. You can click the Back and Next buttons in the flow diagram to move between points in the flow and see the Trace details. If you want to see the entire Trace as a single document, download it by clicking Download Trace Session. For more information, see Using the Trace tool.